Photo Find is a compass for your photos. Get back to that great hiking or camping spot, or just use it to find your car in a parking lot. Watch this video to see how Photo Find works in less than 22 seconds! Snap a picture of a small mushroom in the woods so you can go back later when it's bigger. Share your exact location with friends or family by simply snapping and sending a photo. Take a photo when you park in a big, crowded parking lot to easily point yourself back later. TRY IT: Take 1 minute right now to download the app and load a photo you've taken to see how it works! Here's another quick demo video that shows how you can see where a photo was taken on a map. What photos does it work with? Photo Find works with any photo that has location data. Location data isn't always saved with a photo. It depends on some other factors, like the app used to take the photo, the Privacy settings on that specific iPhone, and whether Airplane Mode is enabled. What location data are you using? How do you get it out of a photo? JPEGs have something called EXIF data, which stands for Exchangeable Image File Format. This is where meta data about the photo, like the type of camera used and location data are stored. So, if it's not a JPEG it won't have location data. Do all apps save location data with a photo? No. For example, last time I tested it if you take a new photo within the Messages app the location data will NOT be saved or included with the photo you send. However, if you use the Camera app and the Privacy settings allow that app to use your location, location data will be saved with the photo. When I send a photo, is location data included? It depends. In our testing, if you send a photo over iMessage that is known to have location data that data will come through. Also, if you email a full size image that is known to have location data, it should end up going through. If the image is resized, however, this information is usually stripped out. Not now. If anyone's interested in working together to develop one, let me know! Hi. I'm John, the creator of the Photo Find. Photo Find is all about exploring and finding your way. GPS is pretty amazing. It's only been around since 1995, and allows us determine our location and reference any exact place on Earth with a simple coordinate system. Even though any location can be represented by just two decimal numbers, it can be annoying to keep track of coordinates or save and share pins. Photo Find lets you easily save, return to, or share an exact location without sending around map pins or coordinates. I think it's the simplest way to get back to the exact location on Earth where a photo was taken using GPS. So why did I create this app in the first place? The idea originally came about while I was hiking with Casey Inman, who is into foraging wild foods. He had taken some classes about identifying different types of edible plants and mushrooms that are around the Northeastern United States (specifically where we live near Syracuse, NY). After a few weeks of going on hikes with Casey, we had started to find some awesome mushrooms growing out of trees (not the trippy kind!). Many were big enough to snag right then and there. But some were not big enough yet, even though they might be in a few weeks or months. I knew that every photo I took since I got my my iPhone 3G had GPS coordinates saved in it. So I started taking pictures of these small mushrooms hoping we’d be able to get back to them later. Can't I already see my photos in a map? I knew I could see all my photos on a map in the Photos app included with every iPhone, so I thought that would be helpful. In practice, though, this wasn't useful. First of all, the map inside the Photos app didn’t show MY current location. So, I’d have to switch back and forth between that and the Google Maps app that showed my location and a small compass arrow to indicate the direction I was facing. This was still difficult, since we were in the middle of nowhere, so there weren’t many landmarks to look at when comparing the maps and satellite images. We were also hiking somewhere that didn’t have designated paths. We were just in the middle of the woods. This would sometimes become a problem when we were done hiking and wanted to head back toward the car, since we wouldn’t know exactly what direction to go. I found myself trying to track our hikes with RunKeeper, then see where we started and try to get back to the car. It worked OK for getting back to the car, but wasn’t a great system for marking spots. So, I thought, wouldn’t it be useful to have a giant arrow that would point to the location where a photo was taken? I mentioned this problem to my roommate Brian Weinreich, and asked if he knew whether compass heading was available to websites in the iPhone's web browser. Within about 10 minutes of that conversation I Googled around and got a simple page working to display my iPhone's compass heading. Brian, my roommate, encouraged me to learn enough about iOS development to build a prototype. I had dabbled in all kinds of programming since the mid 2000s, but this was my first journey into iPhone apps. Brian helped me get started with iOS development and showed me that I could at least get a blank white screen opening on my phone (if you haven’t tried, it can be more frustrating than it seems). Over the next week, I came up with a basic prototype that would allow me to pick a photo from my phone's photo library, see the distance to the photo, and get pointed in the direction of the photo’s coordinates. I'm very thankful for all those that helped along the way. Brian Palma, another guy from the Syracuse, NY area who now works as an iOS developer in Gainesville, FL, helped me a ton after this point, especially with refactoring my code and making things more efficient. 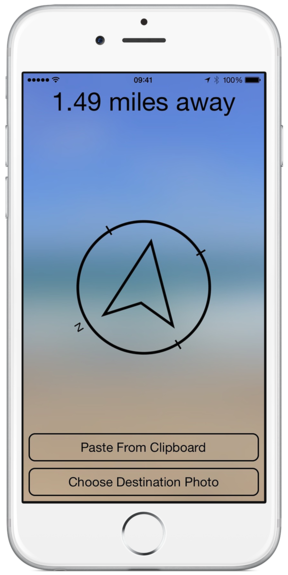 Rob Grazioli, a friend and partner at Rounded, helped me design the compass and arrow for the original web version one morning over coffee at Ryan Cummiskey's camp, and the same one was used in the iPhone app. After releasing the first version in late 2014, I made some updates and launched version 1.1 in January 2015. You can read a blog post from when that was released here. In mid-2015, I got lunch with Toren deRosa. He had just finished his junior year as a computer science student at Binghamton University. During our lunch conversation, I found out that he was interested in learning iOS development. Toren helped me a ton, especially with cleaning up the messy system I had built to switch between screens and replacing it with a more iPhone-native feeling gesture to swipe back and forth. He played a huge role in version 1.2, which was released near the end of November 2015. Photo Find is for explorers everywhere. Take a picture then go get lost, because now you can find your way back easily. I want this app to be on everyone’s phone, because I think there are times when it’s indispensable. I know it’s not the kind of app people will use throughout the day every day, but it’s the kind of app you can keep tucked away on the 4th page of a folder and search for when the time is right. Or, there's the handy Today widget so you don't ever need to find the app and you can quickly copy a photo to see if it has location data! Secondarily, I want to promote the metric system. Have you noticed feet and miles are an in-app purchase? The US should go metric! If you like it, please tell one person! I made this app free so everyone can use it. If you like it, I ask you to "pay" by telling one other person about it! Just use the big “Share Photo Find” Button on the settings screen of the app, or show someone how it works in person. This app was made in Upstate NY. It's a beautiful area of the world with nice hiking spots, great water, and food from local farms. I want to hear from you. Come visit the area and say hi! Contact - © 2015 Ganotis Holdings, Inc.